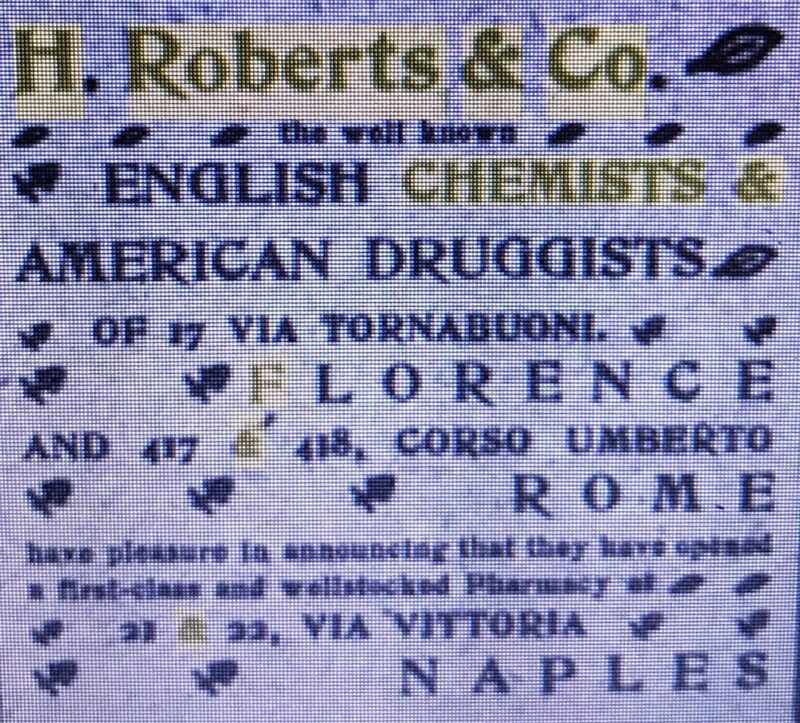 H. Roberts was an English chemist and druggist that established a pharmacy in Florence, Italy in the mid-1800’s. The business was featured in “Murray’s Handbook of Florence and it’s Environs” published in 1867. Apothecaries. – Mr. Roberts, an English chemist and druggist, at the Pharmacy of the British Legation, No. 17 in the Via dei Tornabuoni will be the best person to whom the making up of English prescriptions can be confided, as he has several English assistants; he keeps an extensive stock of English patent medicines, perfumery, teas, and a good supply of foreign and of the superior qualities of Italian wines. 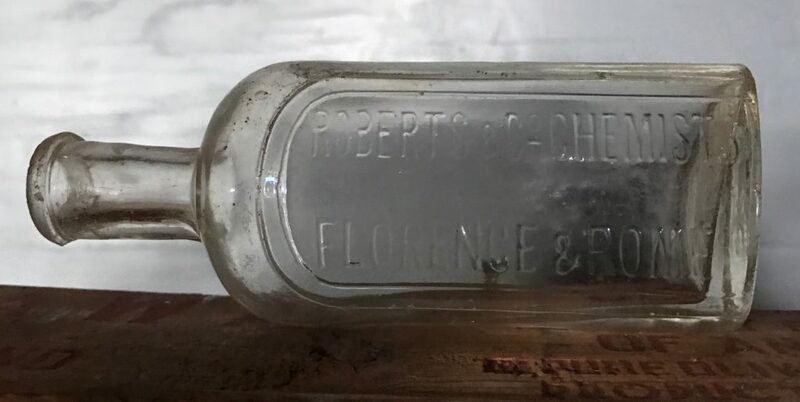 In addition to his business as a dispensing chemist, Mr. Roberts carries a large wholesale trade, supplying most of the apothecaries in the Tuscan and neighboring Italian towns. Groves, Borgo, Ognisanti (also English), Forini, Piazza della Signori. The business was also mentioned in the 1863 edition of Murray’s Handbook. The fact that it was a business worthy of inclusion in a travel guide suggests that by the early 1860’s it was an established business so it probably dates back to at least the 1850’s. 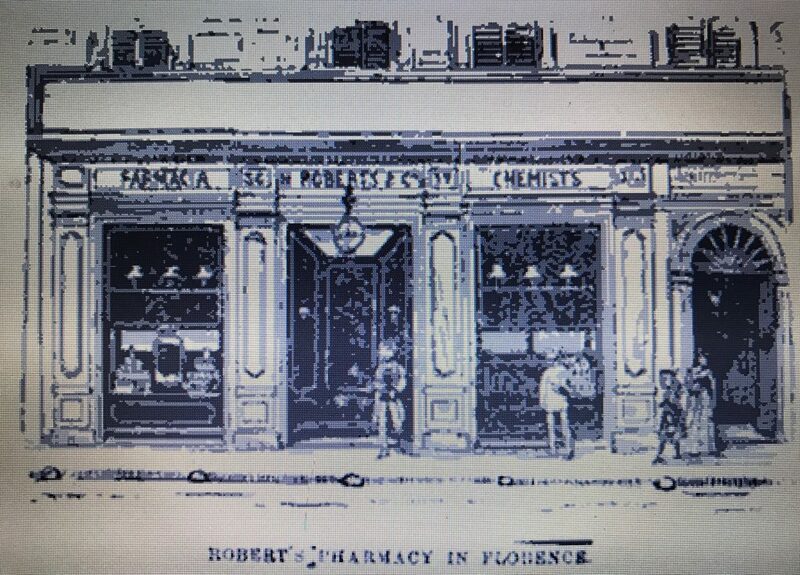 Florence boasts of two large and handsome English Pharmacies- the old established business H. Roberts & Co., and that of Henry Groves, the eminent botanist whose death in March last was so greatly lamented by his many English and Italian friends, and by the world of botanical science. The main room of the Farmacia Roberts is probably larger than other pharmacy in England or on the Continent, and the principal room in Grove’s establishment is nearly as large. Both firms are compelled to carry a very varied stock, including nearly all medicines in general demand in England, owing to the large number of English visitors and residents. They also have large stocks of English perfumes, soaps, brushes, etc. Meters. Roberts & Co. have developed a large trade in numerous specialties which they advertise in Italy. The Italians have great confidence in English drugs and medicines, and the firm does business with chemists in all the principal towns of Italy and endeavor to keep up with the times by procuring all the new preparations as they come out. The firm has a branch establishment in Rome. According to the above article, prior to 1892 the company had established a branch in Rome. Subsequently, a 1905 item in the April 1 Issue of the Pharmaceutical Journal announced the opening of a Milan location and in 1908, an advertisement announced another new location in Naples. It appears that at some point the business became Manetti & Roberts. According to bloomberg.com: “Manetti & Roberts has a rich history dating back to 1843 when it started operations in Florence.” This suggests that the Roberts of Manetti and Roberts was the same Roberts as Roberts and Co. It also establishes the start date for the company as 1843. Today, Manetti and Roberts operates as a subsidiary of the Bolton Group, B.V. The bottle I found is a small (approximately 4 oz) mouth blown medicine. It’s embossed with the locations “Florence and Rome” so it possibly dates prior to 1905 when they added the Milan location. How it got to the south shore of Long Island is anybody’s guess. Previous Previous post: Husband’s Calcined Magnesia, Philadelphia.